Think about your overall station architecture and imagine where you want to be 10 years or more from now. Try as best you can to buy things today that will fit into your vision for tomorrow. There are many good choices on the used and new market. Almost any modern 100 Watt transceiver, less than 10 years old, will have what you need for now and the future. You will want a radio you can communicate with using a laptop or desk top PC. Computer control is becoming a must. Keep in mind that almost all DXpeditions will operate "split." This means they will transmit on one frequency and listen on another, usually a few kHz up. Best practice is to have a radio that will allow you to listen to the DX transmit while turning through the pile-up to find the station he/she is working Try for a radio with "dual watch" (Icom) or the Elecraft and Yaesu equivalent. This will allow you to listen to the DX and tune through the pile-up at the same time. Otherwise you will switch between VFO A and B or use RIT to track who and what frequency the DX is working. This becomes your frequency to send your call sign. More about this later. Where next to spend the money? Antenna or Amplifier? This is an age old question. It seems to me that if you are space or deed restriction limited to a vertical or wire dipole, then I think the choice is a modest amplifier to begin; something with more punch later. But if you can erect a tower, then the choice becomes a modest beam first and then the amplifier. Think about this: most modest beams will give at least 3 to 5 dB of gain. Attached to a 100 Watt transmitter, this means 200 to 300 Watts of Effective Radiated Power (ERP), minus coax loss. All coax will have some degree of loss. Something like RG-213 or LMR-400 will provide good performance for runs up to 200 feet or so. Longer runs will require something with less loss. Don't economize on coax! The low loss stuff is worth every penny. 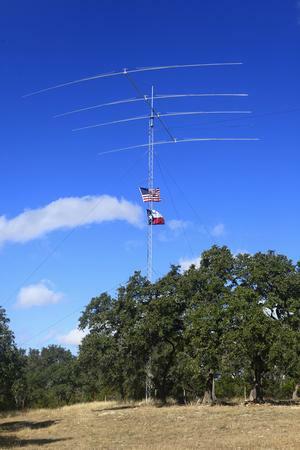 A vertical antenna will get you many, many DX contacts into your log. There are many choices, elevated without radials or ground mounted with radials. Ground mounted, many short radials are better that a few long ones. See the ARRL Antenna book and the Handbook. These will tell you that 16 ground mounted radials are minimum, 32 better, 64 good enough. More than this is certainly OK but you will be dealing with diminishing returns from your wire investment. Keep in mind that Ham Radio is all about tradeoff's. Amateurs are moving to electronic logging using a laptop or desk top PC. Whatever, try to dedicate one to your station; and old one will do. I run Win7 on my ham machine with multiple USB ports installed to give me multiple ports, using USB to Serial converters for my legacy equipment. You will not need high processing speed nor a lot of RAM. Ham radio software is not a resource hog. Software is discussed in another section and you are going to want to use it. For now, know that you will want a package which will work easily with your radio, connect to a DX spotting network, and which you can use with LoTW and Club Log. More about all of this later. Below you will see pictures of three stations, those of N7RF, K5NOF and K9ROD. All three commenced Amateur Radio with modest stations and antennas years ago, but both had a long term vision. N7RF uses Yaesu and added a second Yaesu FT-950 to his shack. The 950 is several years out of production. Its replacement, the FT-1200, does pretty much the exact same stuff but the knobs and interfaces are different. He opted for familiarity and commonality and purchased a second 950 on eBay that had very low hours on the clock. Station 2 will be devoted to VHF/UHF operations, six meters directly, and 144/432/1296 (etc.) via transverters. He kept his Rig Expert Standard (CAT/CODEX interface) for controlling the CAT functions on station 1, but added a Signal Link USB audio CODEX (audio interface only - no CAT function) so he could route the audio to the PC from either radio. 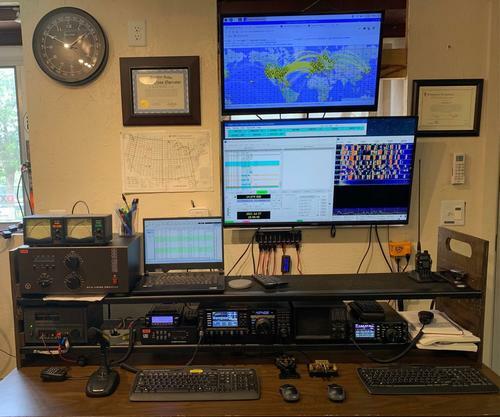 The HF station retains the CAT so he can still click on the Ham Radio Deluxe DX cluster display and have the radio jump over to any DX station of interest. The easily installed Signal Link lets me operate digital modes on both radios without changing any cables. 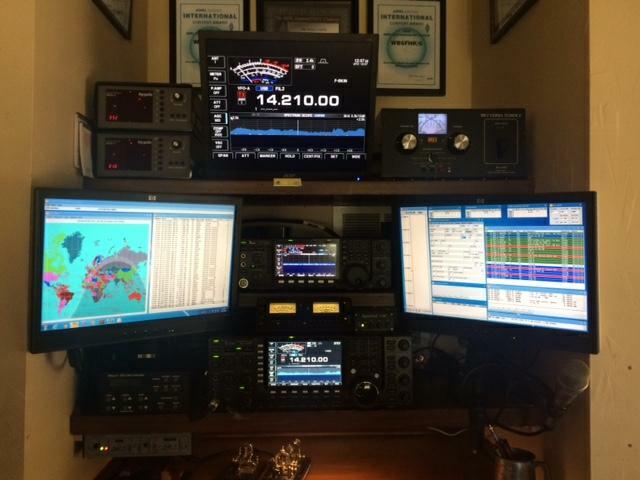 K5NOF uses an Icom IC-7700 and a IC-7600 to a PW-1 amplifier hidden in the closet at left. The nice thing about the PW-1 is the remote control head and the ability to select two inputs and up to four antennas from the remote. 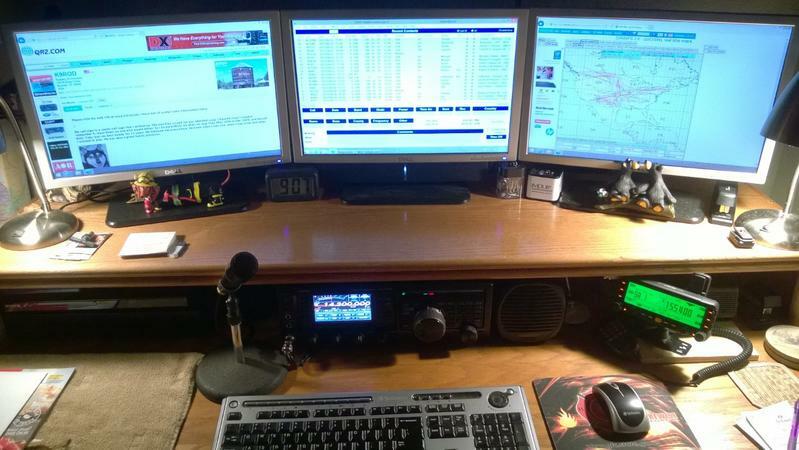 From left to right on the top shelf are two DCU-2 rotor controllers, a remote monitor for the 7700, and a MFJ-989D. On the second shelf, a left monitor and right monitor presently showing DX4Win, with the PW-1 controller and SteppIR controller at center. On the bottom shelf, the IC-7700 at left and the IC-7600 at right. A legacy DX-Doubler is suspended from the bottom shelf. This allows switching audio, mike and keys from one radio to another manually or by computer. Keying is done via the LPT port, DX4Win has a kernel to allow this. A Signal Link is used for a CODEX sound card. 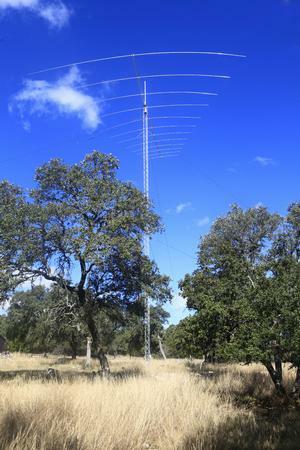 Antennas consist of the StepIR vertical (not shown below), a 40m Yagi, and a Log Periodic Array (LPA) for 30m to 10m, with a 268 foot Carolina Windom hung between the two towers for 80m and 160m. Yaesu FTdx-1200 for HF and Yaesu FTM-350 for VHF & UHF – Triple monitors to display logging program (Middle), QRZ (Left), and DX Maps (Right) all at the same time. An external speaker with the HF rig so that the sound is not muffled by the desk top. The desk mike is custom designed with a foot switch. Two small lamps on both side with led bulbs light up just the desk area.